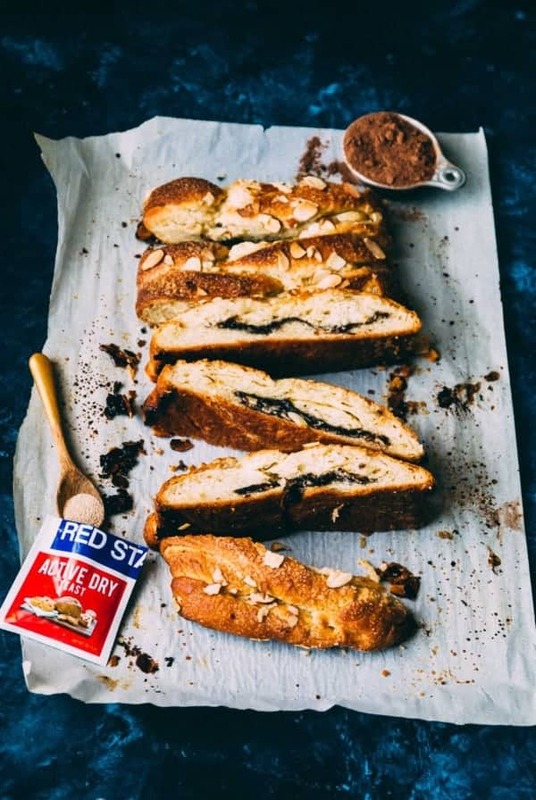 If there’s anything I learned from asking you, my lovely readers to tell me about yourself, it’s that you all want good, tasty desserts that don’t take a lot of time to make and don’t require crazy amounts of skills to bake. You have been heard! 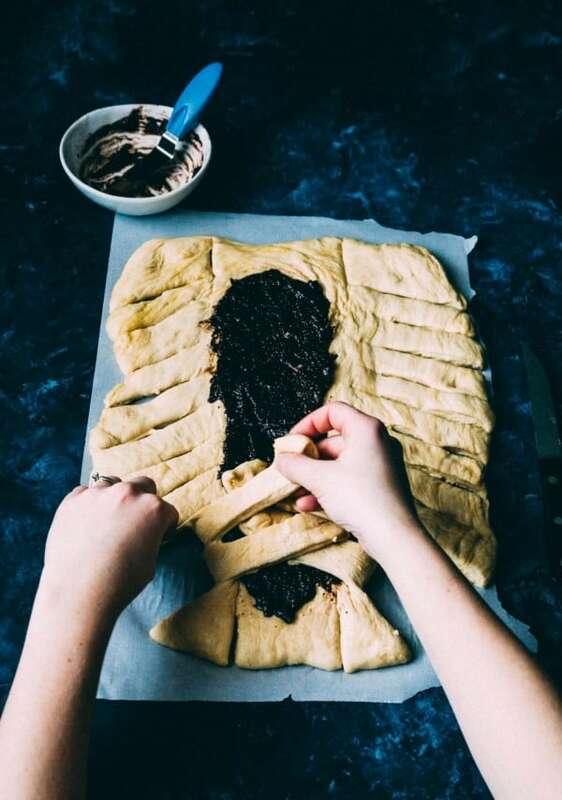 I started out brainstorming this chocolate vegan danish braid because it’s always been on my ‘to-bake’ list. While I’ve done the usual loaves of bread and make more than my fair share of homemade pizza crusts, I hadn’t quite tackled some of the seemingly more complex pastries yet for the blog. One of the biggest issues was time (go figure) and the other was fear that no one would try it. 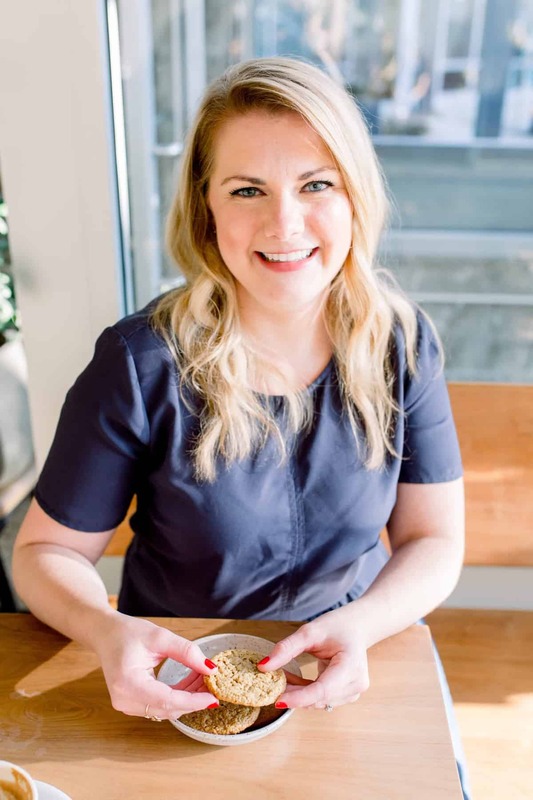 Tackling the ever-daunting yeasted bread or pastries seems to be a fear no one wants to face, until you plow on through the task head on and realize, that like ripping off a band aid, it’s not as bad as it seems. Trust me, I’ve never been afraid of baking with yeast and it’s almost never let me down, you can do it too! Especially when there is a chocolate vegan danish braid at the end of the road, it’s worth the risk. 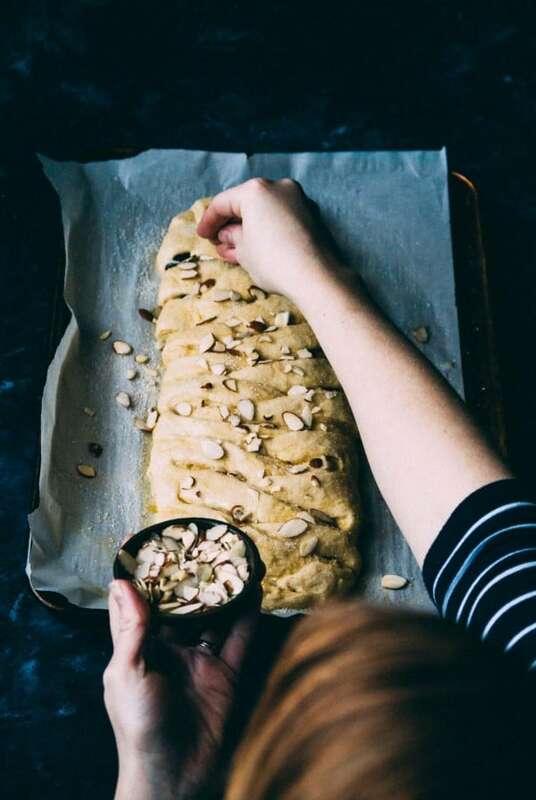 For a usual danish braid recipe, there is a lot of hands on and hands off time required, from kneading to laminating (forming flaky pastry layers) to rising and just plain waiting. 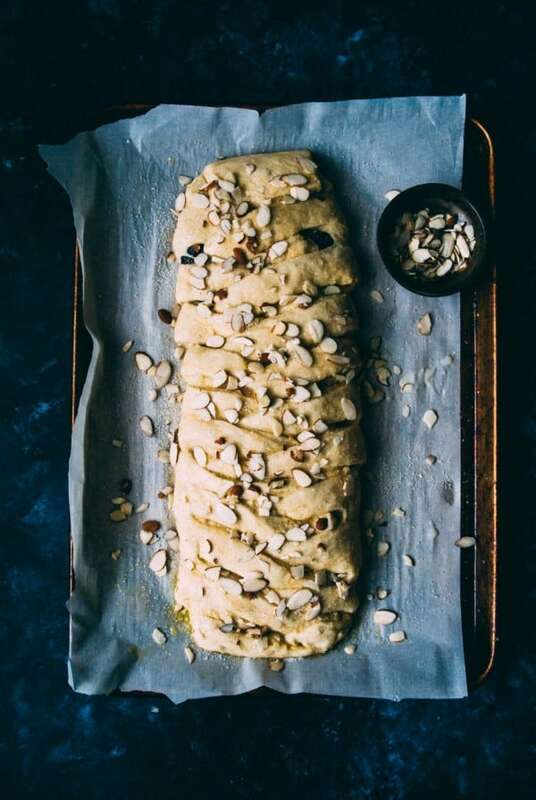 I knew this was something I didn’t have the patience for and I wanted to make this vegan danish braid as easy and painless as possible, so you just might try it too. I cut out a lot of the laminating and rising time, instead replacing it with a hefty dose of olive oil in the initial dough mixture and a rise overnight to ensure it forms those fluffy, sweet pockets of goodness that any good pastry comes with. I think after developing this recipe, olive oil danish pastry dough is going to be my go-to vegan pastry dough, especially since it doesn’t involve waiting for coconut oil to soften up and eliminates the need for extra kneading. Normally in a danish pastry dough, you would knead in a butter package and continue to turn and laminate it, but with this method, it’s a mix the dough in a bowl and let it rise method. Sounds kind of ideal, right? I was doubtful of the results at first too, but trust me, it makes a chocolate vegan danish pastry that is just as good as any other. Also, word of advice, use good yeast! Nothing is worse than mixing everything together and then realizing your yeast didn’t activate, use the good quality stuff. If the instructions on cutting and braiding the vegan danish braid seem a little too complex, I’ve made a little GIF up above to make it a bit easier! I know reading recipe instructions sometimes isn’t enough, so showing you the process seemed a bit easier. Once you get into the groove of alternating the strips back and forth to braid them, it goes really quickly and seems like a breeze by the end! Also, I added extra sugar and sliced almonds on top, but the toppings are all up to you. I honestly can’t even tell you how much I love baking with yeast, pulling the final result out of the oven and fist pumping because I just know it’s a winner. Seriously, when I pulled this braid out of the oven I said ‘DANG that looks good’ (to no one but myself and my cat), but the feeling of conquering something and making it even easier to make, feels so good! As a quick sidenote, a few of the most lovely blogger friends are raising awareness about immigrant food stories today and creating wonderful posts around them. Follow them along at #immigrantfoodstories and give them a little love. I’m so proud to be part of such a caring group of people and hearing their stories is awe inspiring and a plentiful reminder of who we are and where we came from. 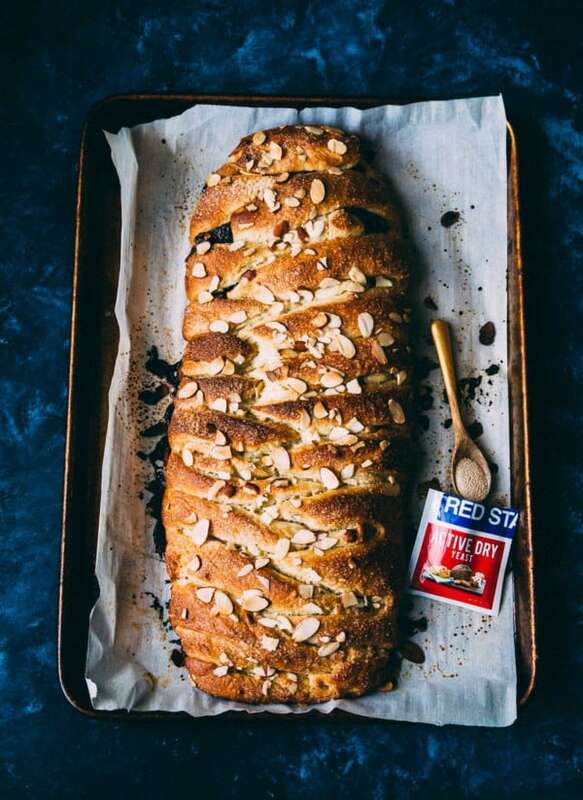 Cheers to Tuesday and wishing I could send you all a piece of this danish braid today! Vegan Chocolate Danish Braid- A perfectly tender and sweet vegan danish braid, with a rich chocolate filling! In a small bowl, combine the yeast, sugar, and warm water. Set aside for 5 minutes, or until foamy. In a large bowl, whisk together the salt, olive oil, 3 tbs. warm water, cornstarch, cashew milk, and vanilla extract, then add the yeast mixture. After mixture has been combined, stir in the flour until dough starts to form and come together easily. Cover bowl with a towel and set aside to rise for at least 4 hours, or overnight. Line a rimmed baking sheet with parchment paper and set aside. Prepare filling by stirring together all of the filling ingredients in a small bowl and set aside. After dough has risen, roll out dough on a well floured surface into a rectangle that is 9 by 16 inches. If dough starts to stick or pull, sprinkle on additional flour and continue to roll out. After dough has been rolled out, transfer the rectangle to the prepared baking sheet. Spread the prepared chocolate filling down the middle of the dough, spreading it down the middle third of the dough rectangle. Using a sharp knife, make cuts on both sides of the rectangle, at a diagonal angle and measuring 1 inch wide and about 2-3 inches long. Start to alternately overlap the strips, folding either end up after all strips have been braided. Cover the braid with a towel and let rise for 30 minutes. After braid has risen, whisk together the ingredients for the vegan egg wash (cashew milk and agave nectar) and lightly brush it onto the top of the braid. 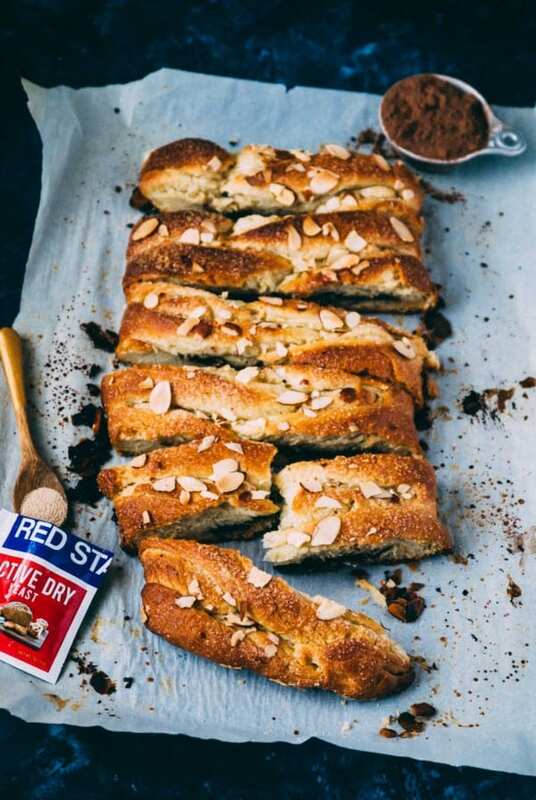 Sprinkle with the cane sugar and sliced almonds. Preheat oven to 375 degrees F and bake braid for 15 minutes. Reduce heat to 350 degrees F and bake for another 15 minutes. After braid has baked, remove from oven and allow to cool slightly before slicing. Store in a sealed container for up to 3 days. This is a work of art, Abby! I just love braided breads, but haven’t really tackled this style/shape before. So that GIF is super helpful and I can’t wait to make this. I mean – chocolate, so yeah. And maybe my favorite photographs of yours ever! Photos looking great on that new background!!! On behalf of my vegan daughter…and my entire family…thank you for sharing this gorgeous recipe! This is gorgeous! Great flavor combo! This is amazing! And I’m even more intrigued that it is vegan! Thanks for the reply! Ummm, combine the yeast mixture in with step two I presume? It’s 1:00am so I could be missing something. This braid is beautiful and that filling is mouth-watering!